Our relationship with Grupo Cajolá is strong and we consistently exchange education and learning experiences through conferences and delegation tours. Furthermore, Grupo Cajolá is made up of producers, cooperatives, and associations, each of which provides our social enterprise initiative Café R.E.D. with the best products they offer, such as farm fresh eggs, beautifully designed crafts, and even the furniture! The restaurant gladly serves as the showroom for their line of restaurant furniture and lighting made by the carpenter cooperative. DESGUA has proudly supports Grupo Cajolá. In the past we have assisted with their audio visual center, internet café, webpage, and video editing for their documentary “Cajolá Pueblo en Resistencia”. Grupo Cajolá was formed in the year 2000 in Morristown, New Jersey, when a group from the town of Cajola, Guatemala organized themselves to watch over Cajolenses and other fellow countrymen who may be facing problems, illness, accidents or death while in the United States. As they started working together, they began to learn why they migrated, about the history of Guatemala, the structural causes of its political and economic problems, and globalization. 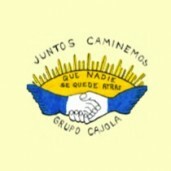 When some members from Grupo Cajolá in Morristown returned to Cajolá in 2005 they began the work of Association Grupo Cajolá. Grupo Cajolá in Cajolá works heavily in economic development by providing start-up capital and on-going training to a group interests in working in a cooperative style business. Currently they are nurturing two women´s businesses The Egg Farm of Cajolá and MayaMam Weavers and one men´s business Talent Tree Carpentry of Cajolá.